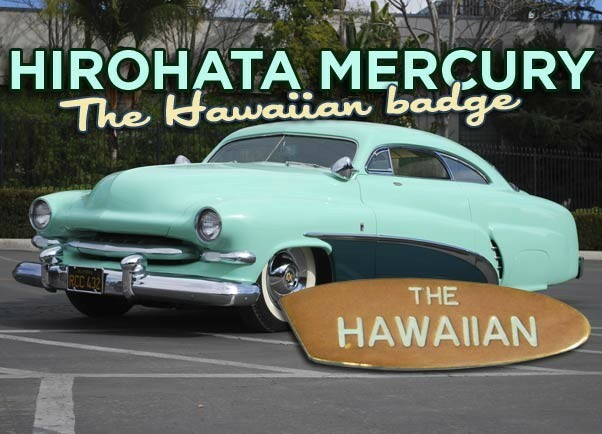 Since the Hirohata Mercury was restored it always had an oddly shaped and located brass badge with the name The Hawaiian on the door… Lets find out the story behind the badge. Howard Gribble recently send me an email including a photo of the Bob Hirohata Merc which he took at this recent visit (January, 2016) to the new Petersen Museum. He noticed that the “Hawaiian” badge on the door, which had been part of the restored Hirohata Mercury for years, was missing. He wondered when this badge was removed from the car, especially knowing this would have involved a paint touch up. 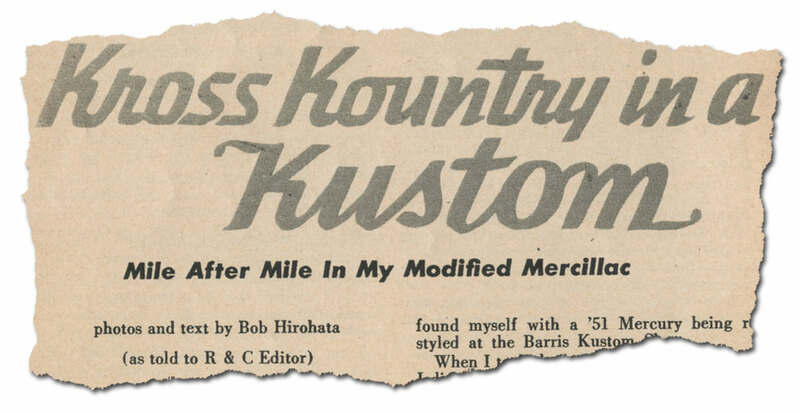 Howards email reminded me that I still wanted to do an CCC-Article on this controversial Hawaiian Badge that was part of the restored 1951 Mercury, but as far as we could tell, it was never on the car when Bob Hirohata owned the car. 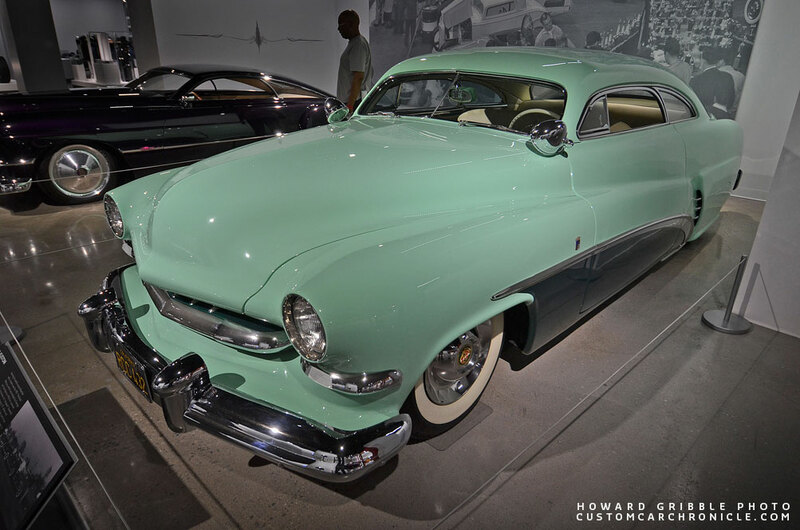 Howard took this photo of the Hirohata Mercury at the Petersen Museum in January 2016, no sign of the drivers door mounted Hawaiian badge. I took this photo of the Hirohata Mercury in 2011, and the Hawaiian badge is mounted on the drivers door, just below the vent window. The Hawaiian badge was made of a hand shaped and polished piece of sheet brass with the letters engraved and painted the sea-foam body color. The Hawaiian Badge was recently removed from the car, when the Mercury was cleaned, fine tuned, updated and made ready for the prestigious Mercury Gathering at the 2015 Pebble Beach Concourse D’Elegance. 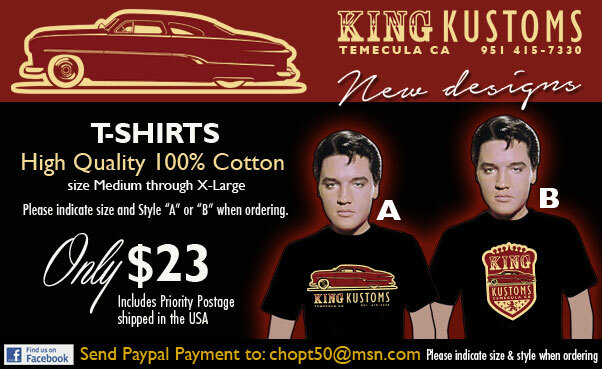 The car spend some quality time at Junior Conway’s House of Color Shop in Bell Gardens, Ca. for an full update. 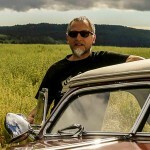 The restoration of the car was completed in 1998-99 and since then the car had traveled to many shows including all the way to Sweden. So it was time for some touch-ups etc to be in excellent condition for the Pebble Beach show. While the car was in Conway’s shop and body sections had to be touched up, it was decided it was a good time to remove the Hawaiian badge as well. On a visit with Roger O’Dell to the Junior Conway shop John Denich took some photos of the Hirohata Mercury being fine tuned for the Pebble Beach event. Apparently there were some fit problems on the rear window lower stainless trim. The Hirohata Mercury was cleaned and detailed inside and out. John Denich took this photo which shows that the badge was now gone. 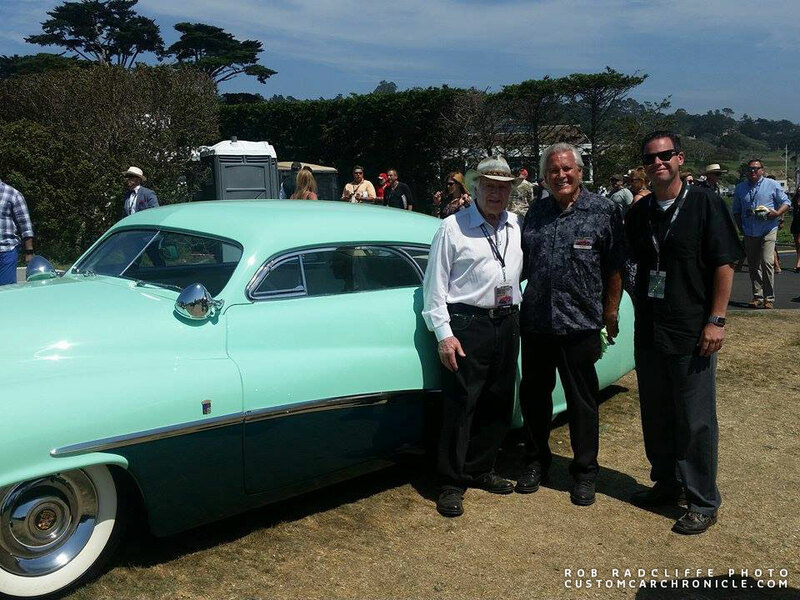 The Hirohata Mercury at the Pebble Beach Concourse with painter Junior Conway on the left, owner Jim McNiel in the center, and Rob Radcliffe on the right. Lets take a step back and look at the history on this The Hawaiian badge on the Hirohata Mercury. Ever since the Mercury was restored by Jim McNiel the Hawaiian badge was part of the car. But none of the old photos I had seen on the car show this badge. 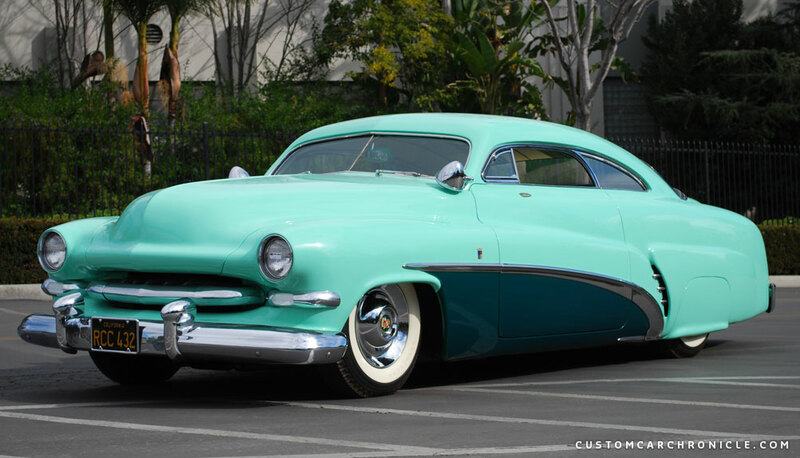 At this time we are not 100% sure Bob ever named his Mercury “The Hawaiian“. 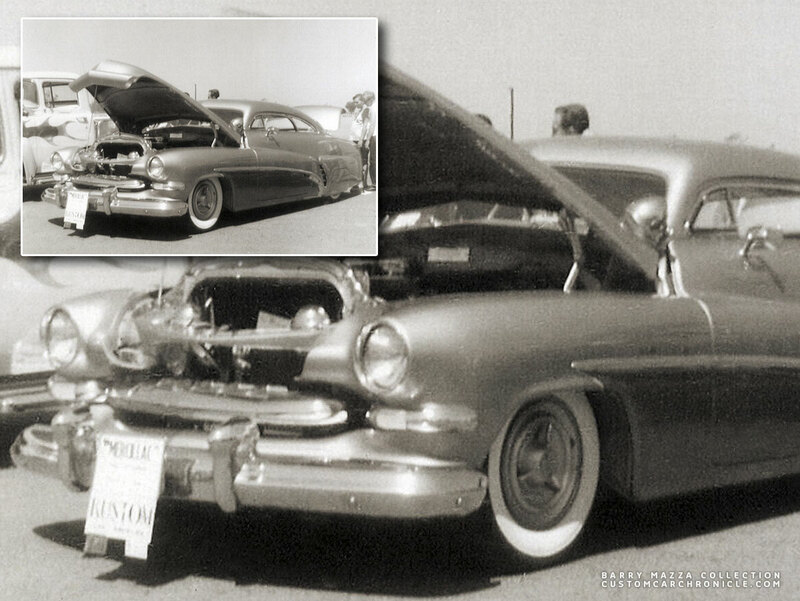 Some people have referred to the car by that name, possibly even before Jim McNiel restored the car, but we do not have any proof for the name connected to Bob. We do know that Bob named his Mercury the “Mercillac” after he had installed brand new Cadillac engine for his cross country tip in 1953. And as far as we know there was never a badge or emblem with this name added on the out or inside of the car when Bob owned it. It might be possible that Bob renamed the car in the mid 1950’s when he was about to sell it, but agian there are no photos or info to proof this. 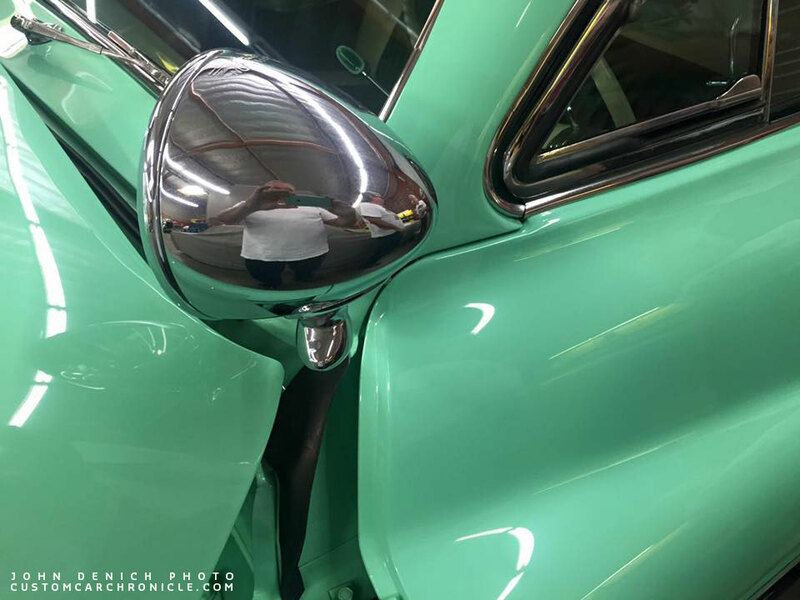 There are several photos of the Hirohata Mercury, after it was repainted by the Barris Kustom Shop in lime green, that show a side view mirror on the drivers door, mounted just below the vent window. This was on the same location as later the Hawaiian badge would be at. When I asked Jim McNiel about the Hawaiian badge and also about the side view mirror he mentioned that most likely Bob was stopped a lot by the cops, and perhaps even ticketed for having no side view mirrors. So in the end the mirror was added and screwed to the door. There are also stories that the mirror was added to the Mercury requested by the Movie company when the car was hired for the Running Wild movie. And judging all the photos of the Mercury after it was repainted, the later might actually be the real reason why there was a mirror on the Merc. After Bob Hirohata sold the car in 1955 the new owner installed a hitch and used the Mercury to pull his speed boat, for that the mirrors must have come in handy. Mamie Van Doren poses with the Hirohata Mercury painted lime green at the Running Wild Movie set. The side view mirror can be clearly seen in this photo. 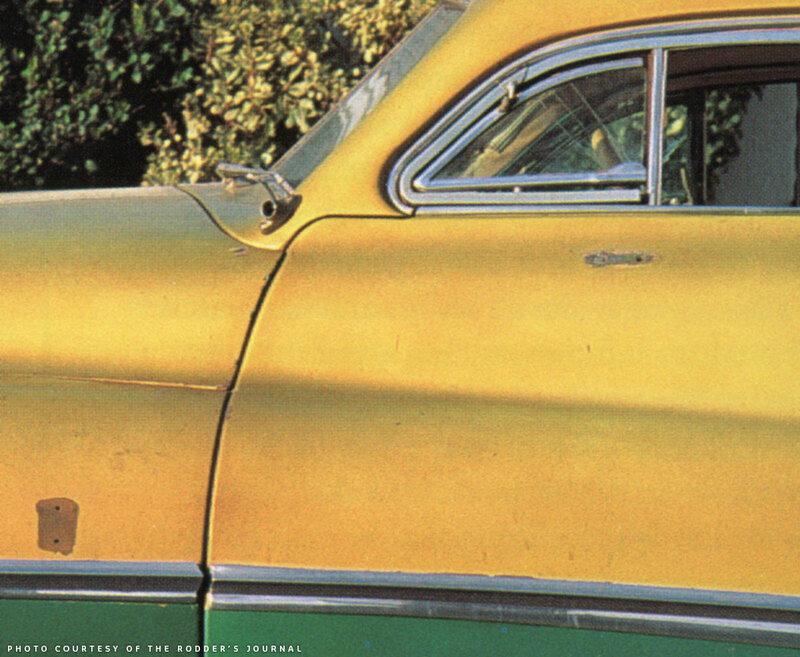 This photo from the Barry Mazza Collection shows Bob Hirohata’s Mercury after it had been repainted Lime green (after the Running Wild Movie) with some three bar flipper hubcaps. The photo was taken at an unidentified outdoor show, most likely in 1955. 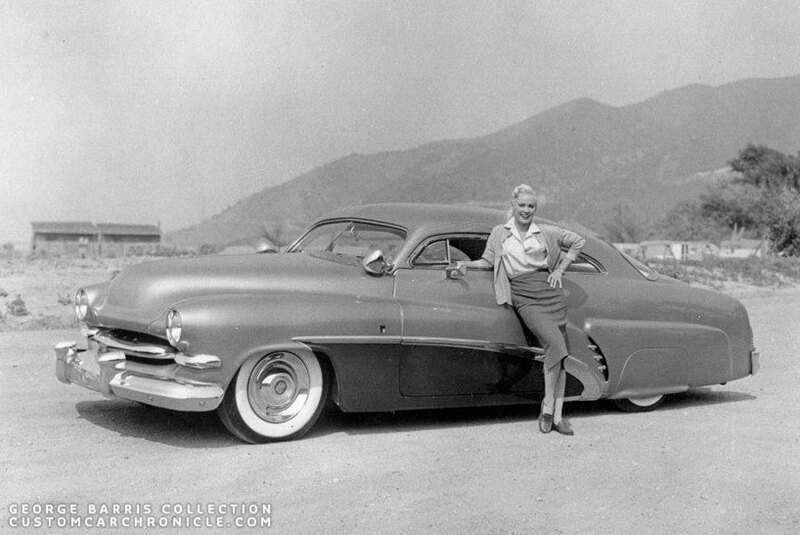 The most interesting about the photo is that the car has the mirror mounted, and a show card mounted on the front bumper with on the lower section Kustoms of Los Angeles, and on the top the “MERCILLAC” name. Unsure is if Bob Hirohata still owned the Mercury when this photo was taken, most likely it was. Close up of the mirror which appears to have a teardrop shaped base. Jim mentioned that is was one of the previous owners of the Hirohata Mercury, most likely Dirty Doug Kinney, who removed the mirror in the late 1950’s. Most likely he did not want to fill the holes and repaint the doors, so he decided to create a badge that would cover the holes left from the side view mirror. He shaped the brass badge in a similar shape as the mirror base to cover up all evidence of the mirror. He then engraved the “The Hawaiian” name into the brass badge. When Jim bought the Hirohata Mercury for $500.- in late 1959, or early 1960 the Hawaiian badge was on the car. This photo from the Rodder’s Journal issue number 5 show that both The Hawaiian badge and the Barris crest are missing from the car at this point… Jim stored the originals in the house, making sure they would not get lost. We can however see the holes drilled for the mirror an later the badge. Jim takes out the Hirohata Mercury for the last time before the restoration starts. I took this photo of the badge at the 2009 Sacramento Autorama Mercury Gathering. Here I spoke with Jim about many details of the Hirohata Mercury, including the history of the Hawaiian badge. 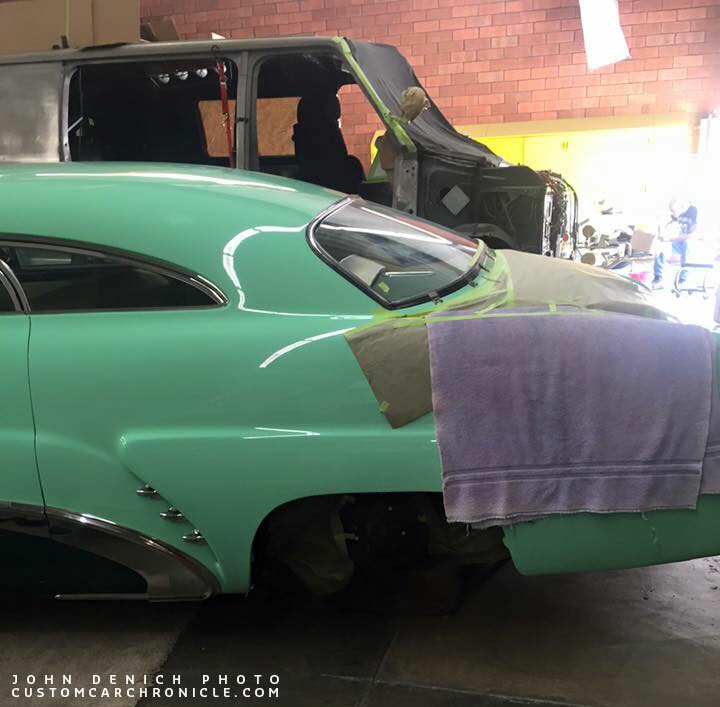 When Jim set out to restore the Hirohata mercury in the 1990’s he decided to take the car back to how it looked when Bob Hirohata owned the car in about 1953. But since the Hawwaiian badge had always been part of the car for as long as Jim owned it he decided the badge would be part of the restoration. The Badge has since then always been a great topic of conversation every time the car was displayed. The use of the badge was controversial to say the least. 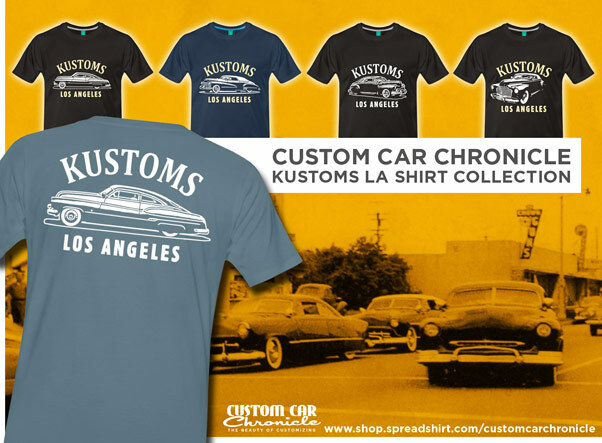 Most historic Custom Car enthusiasts, including myself always felt the badge should not have been used, and the holes should have been filled in to bring the car back to how Bob Hirohata had it in 1953. 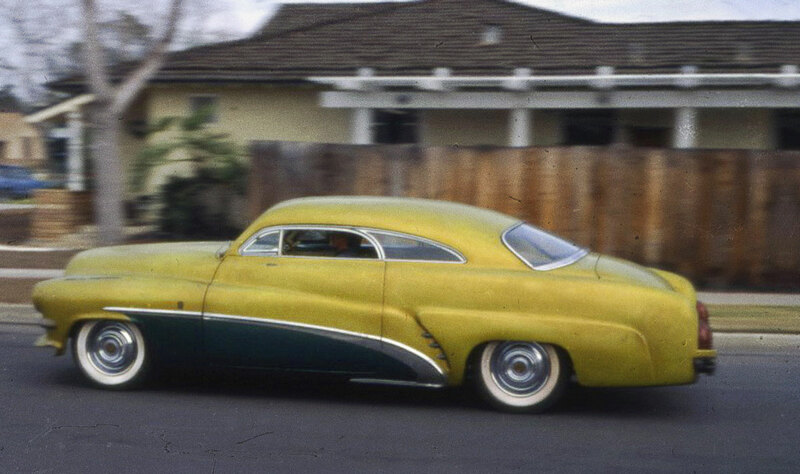 Fortunately Jim McNiel decided that when it was time to fix up the Hirohata Mercury for the prestigious Pebble Beach Concourse 1949-1951 Mercury Kustom event, it was time to bring the car back to how Bob Hirohata drove it cross country and entered it in many car shows. 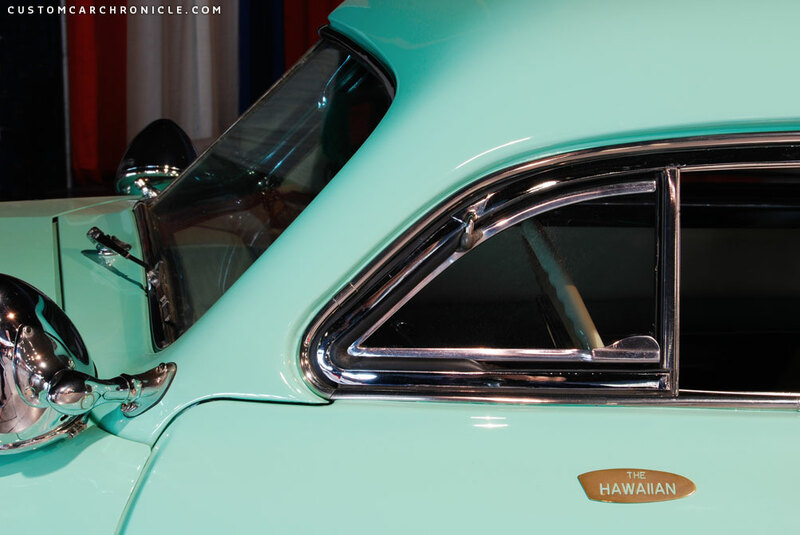 The Hirohata Mercury has always been one of my most favorite Custom Cars, and seeing the restored car in person sure was a Custom Car highlight for me, but the Hawaiian badge always bugged me a little… like a smudge you want to clean off. With the badge removed we have Custom Car perfection. 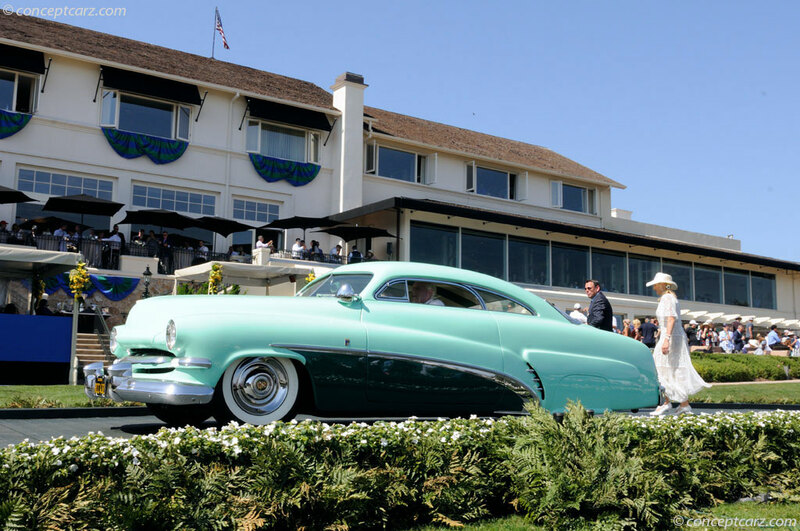 Jim McNiel drives the car up to the podium at the 2015 Pebble beach Concourse to receive his best Custom Award…. without the Hawaiian badge on the door! Rik It was my understanding that Bob Hirohata initially called the car ‘The Hawaiin’ and in the new Barris book on page 57 that seems to be confirmed. I also have been told that the mirror was requested by the movie studio. 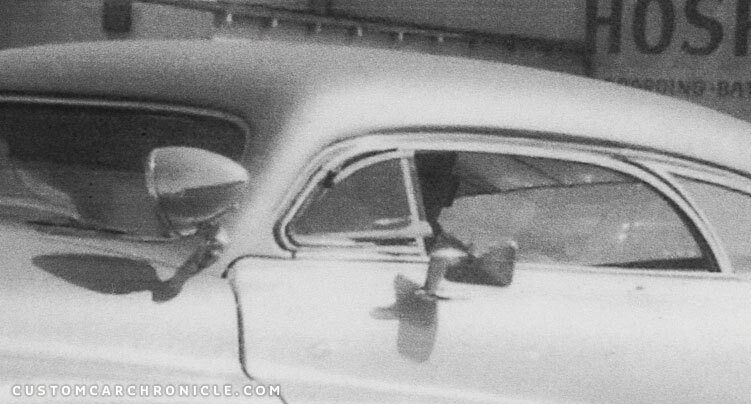 There is a picture of Mamie Van Doran , who was in the movie beside the car and the mirror is present. I’m have also been told that when the movie was over Bob removed the mirror and put that badge on. I am glad it has finally been removed along with those bazar twin antenas..
As for the mirrors might have been requested by the Movie studio, that might be true. I have added that to the text now. That was something I had heard as well, but I thought the words of Jim McNiel on that might weight in a bit more than other things. I’m not sure about that. As for that Bob removed the mirrors after he got it back from the movie shoots. That I do not thing happened. As far as I know the car was in an accident where the whole driver side was dented by the new owner Robert Waldsmith in October 1955. The detail of the mirror photo in the article is from after this accident.. so the mirror was still on the car after Bob had sold it. 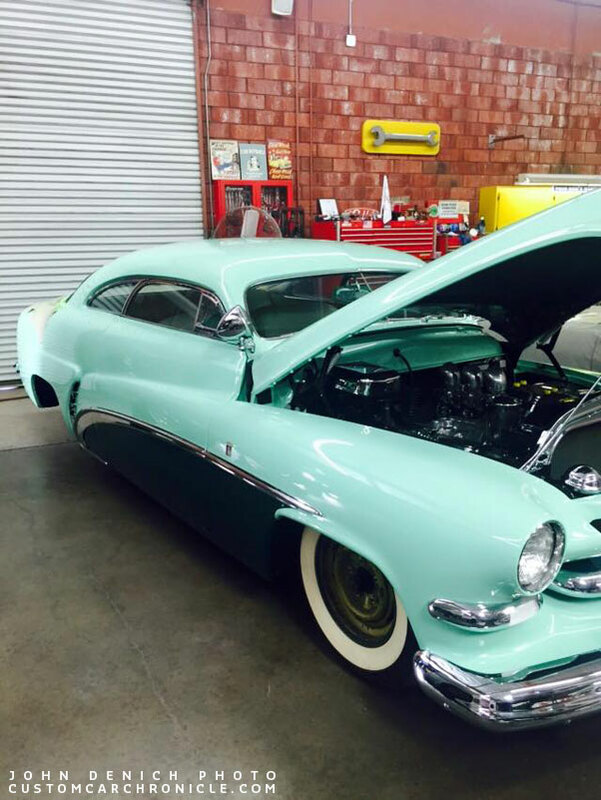 The photo of the Mercury at Junior Conway’s shop, The car looks to still have its previous gold paint on the rims………? Isn’t it funny how something once upon a time no doubt very insignificant becomes something many years later folks notice and ask how or why did that happen, but the answer is lost to time, Excellent job sorting through fuzzy recollections, old pictures and piecing together some well thought out ideas.